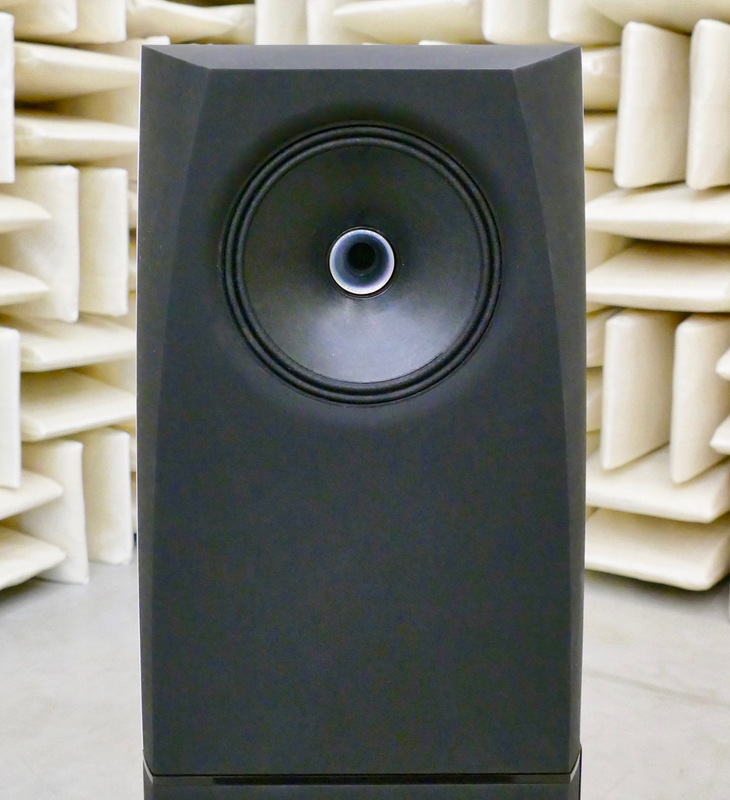 This loudspeaker achieves a level of quality that eludes conventional passive speaker concepts. The neo from genuin audio is consistently based on active technology in combination with highly complex digital signal processing. Therefore the chassis are used in an ideal manner, optimally driven and perfectly controlled. The uncompromising realization of this technical concept in neo leads to an extremely dynamic, transparent and natural music reproduction. 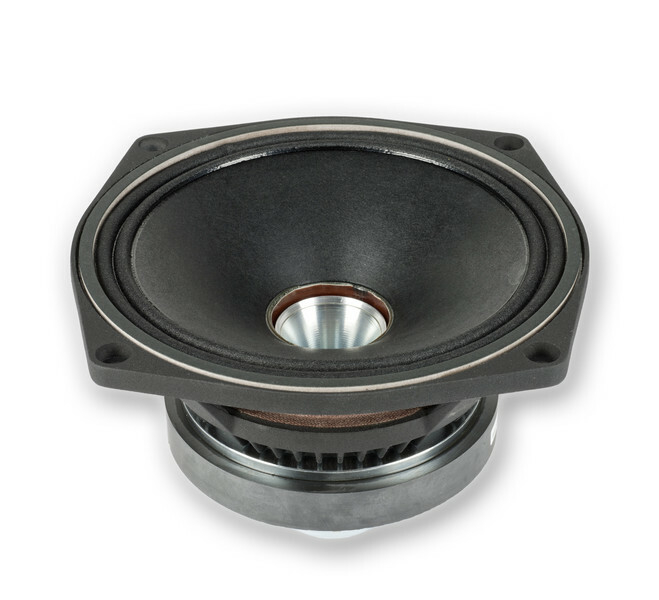 The heart of the fully active 3-way speaker is a digital signal processor. The 32-bit DSP not only replaces a passive crossover and allocates woofer, midrange and tweeter to their respective operating range but the entire speaker system is perfectly in tune with its time coherence and frequency response. In addition to an IIR filtering, notably the technology of performance-data-based linear-phase FIR filtering is used, which Neo’s renowned developer team has successively optimized since the 80s. Every single chassis is tested, and based on these individual test results, tailored programming is carried out for perfect signal processing. In this way, the temporal behavior of the overall system can be so designed that the propagation speed of all frequency components in the music signal is constant. This time-coherence is an essential feature to achieve genuin audio’s central goal of a convincingly authentic music reproduction. 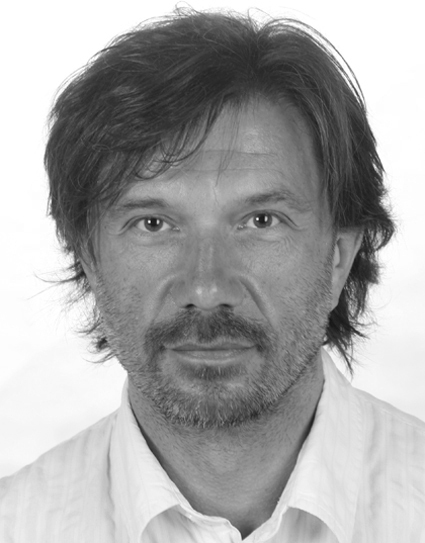 The frequency range relevant to spatial hearing is reproduced by a single coaxial, time-coherent speaker unit. A perfectly harmonious, organic and at the same time high-resolution acoustic pattern with superior sound tracking capabilities comes into being this way. The neo presents music in a holographic way: a singing voice is no longer restricted between the speakers, but flows freely in the room, directly in front of the listener. Each instrument seems individually tangible, each facet can be heard precisely – and yet the experience stays holistic. The horizontal dispersion relative to the central axis is uniform across a large frequency range. Through the corresponding digitally filtered coaxial chassis, the genuine audio neo reaches approx. 90 ° beam width without jumps in any spatial direction. The frontally positioned coaxial loudspeaker on neo is supplemented by a laterally mounted woofer, which operates below 180 Hz and whose frequency response reaches down to 27 Hz (-6 dB). This very long excursion 30-cm bass chassis with extra large voice coil provides for Neo’s physically powerful bass and creates the basis for an uncompromising “full-range” music experience. At the same time, the mighty woofer relieves the coaxial speaker of the demanding task of bass processing and allows it to focus on its core competence: the authentic presentation of space, detail and homogeneity. Loudspeaker drivers from the professional sector were deliberately used in neo. The selected chassis combine high efficiency with maximum power handling. 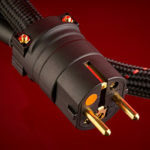 Neo’s woofer can withstand up to 1,200 watts and convinces with extremely low distortion figures. 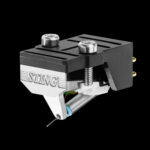 This is the foundation for an exceptionally dynamic reproduction, which is further perfected by the custom-fit DSP control. Another example of intelligent digital control: the skillfully programmed DSP by expert developers ensures by way of a “Look Ahead” analysis that neither chassis nor power amplifiers can be overloaded. The sound always stays clean – even at exorbitantly high volumes! 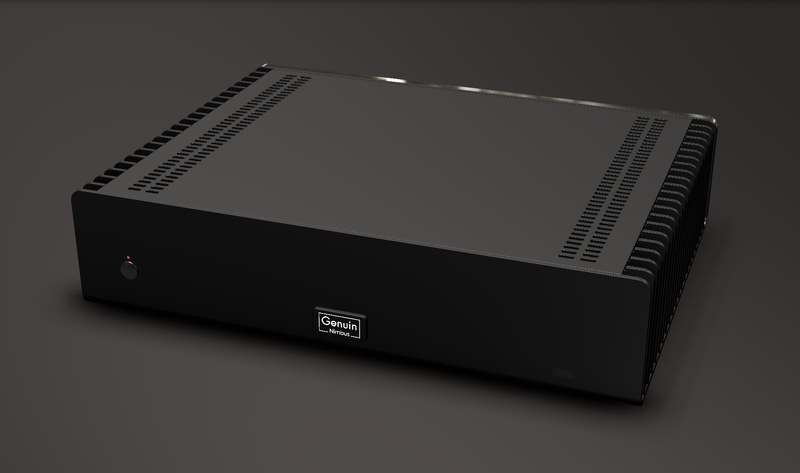 The integrated four-channel power amplifier in UMAC® technology feeds the drivers of every genuin neo the total power of 1,000 watts, thanks to a mighty power supply. Nevertheless no annoying fan is required. In bridged mode, two channels of the class D amplifier module feed solely the woofer, while the tweeter and midrange unit of the coaxial chassis are driven separately by their respective channel. 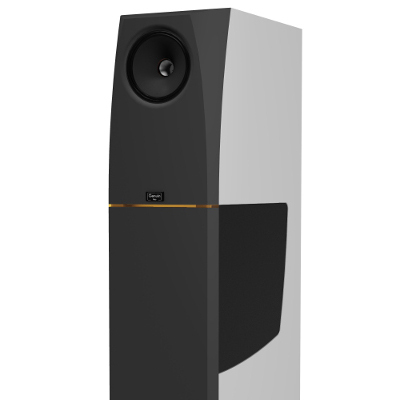 This combination of high driver efficiency paired with exceptional amplifier performance and optimized control via DSP establishes the basis for an extremely dynamic, stupendous live-like performance and the accompanying authenticity of the playback through these extraordinary loudspeakers from genuin audio. 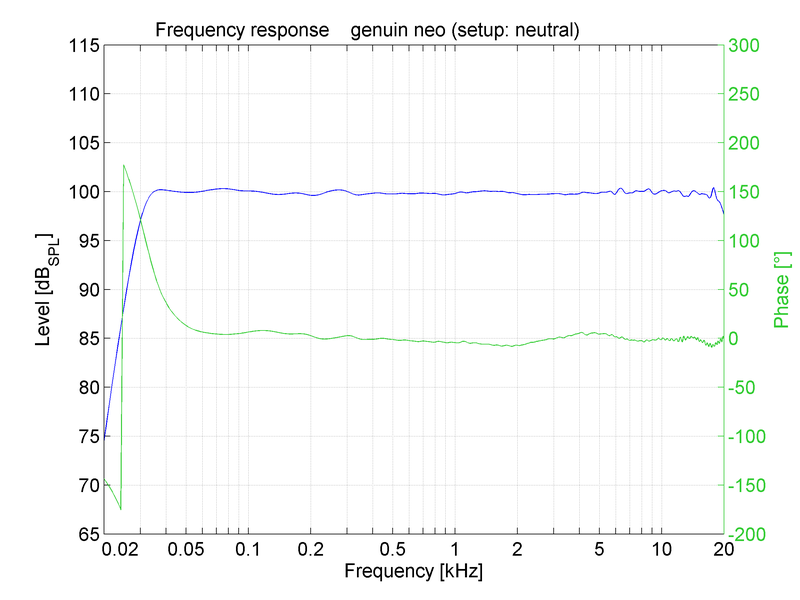 Amplitude frequency response (blue): The entire audio spectrum is shown with extremely low ripple. The -6dB cutoff frequency is 27Hz. Phase response (green): The linear progression of the phase over the almost entire frequency range (60-20kHz) is the result of linear-phase FIR equalization. The slope of the phase is a measure of the group delay and the criterion for the dispersion of one frequency group (pulse signal). Basically, the genuin neo is absolutely neutral in frequency response – under optimal listening conditions. Since such an ideal is very rare among ordinary living situations, the control software of the loudspeaker offers complex solutions for spatial correction. Therefore, even in acoustically unprepared rooms, perfect listening experience can be realised. The genuine neo comes with three presets, which can be selected on the rear touch panel and cover common scenarios: neutral, wall position and hi-fi. For further adaptation to individual room conditions, genuin audio offers an on-site service where a trained acoustician optimizes the speaker to the respective listening situation. Thanks to analog and digital inputs, the genuin neo can be integrated in a variety of working scenarios. For processing through the DSP, analog signals are digitalized via a premium AD converter module. In the DSP, this 24-bit stereo converter is pre patched internally to a single dual-range AD converter with 128 dB dynamic range. 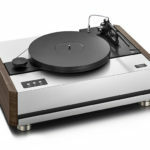 As a result, both high-output sources (mixers, studio equipment) and conventional hi-fi equipment can be connected. What’s particularly promising is the combination of the genuin neo active speaker with a source device like the tars music server which outputs its signal digitally. In this case, the data remain consistently digital and will not be converted until the allocation of the individual amplifier channels in the last step. When using digital sources, it is more efficient to convert a digital signal after the DSP than before a passive crossover – as is the case with conventional loudspeakers. 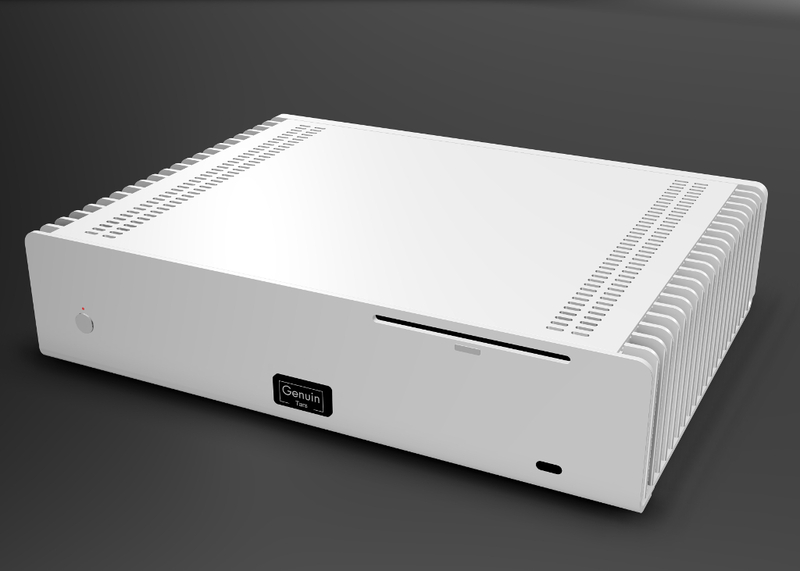 To maximize the potential dynamic range, the DAC section is perfectly adapted to the used power amplifier channels. 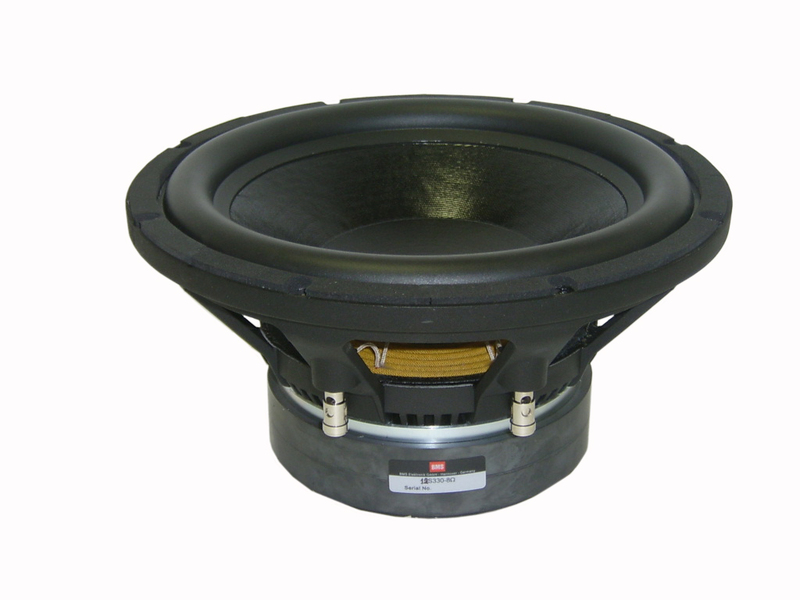 The tremendous movement potential, especially of the powerful woofer chassis, requires a stable frame. Therefore, Neo’s cabinet is made of up to 54mm-thick MDF boards, grooved and internally ribbed. The very generously dimensioned, flow-optimized bass reflex tunnel on the back plays an important part in the effortless playback of the lowest frequencies – even at the highest volumes. 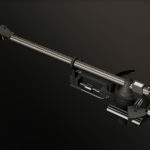 The mid-high range is diffraction optimised through a 3D edge geometry of the front section. This avoidance of edge dispersions contributes to the striking spatial representation of the genuine neo – the music becomes completely independent of the speaker. 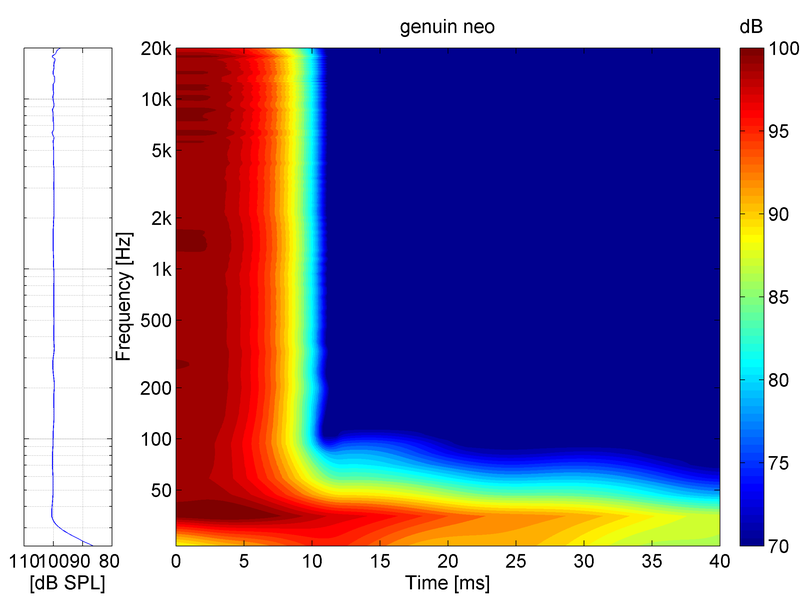 The spectrogram shows the excellent attenuation characteristics of the genuine neo over the time axis (X-axis) against the frequency (Y-axis). The motto of genuin audio turns out to be extremely relevant in neo. Although the loudspeaker already impresses with its appearance – it is the internal technology that makes it a superior product. The thoroughly optimized digital controlling of the three drivers, the perfectly allotted power supply through the four internal amplifier channels and the scope of adaptation to room conditions lead to a level which traditional methods of speaker construction can no longer accomplish. This is a game changer. 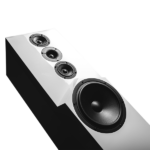 With the neo, the listener literally takes a big step forward – on his way to sonic gratification.